Memphis Express quarterback Johnny Manziel (2) looks for a receiver as he’s pressured by Birmingham Iron defensive lineman Jake Payne (99) during a Birmingham Iron at Memphis Express AAF football game, Sunday, March 24, 2019. Last week I put out an article of players under 26 who I felt deserved a shot in the NFL after their terrific play in the AAF. Well, now I wanted to add several players who caught my eye this season of the AAF. Here they are, let me know if you think we are missing someone. De’Vante Bausby, CB, San Antonio Commanders – The 26-year-old cornerback bounced around the league a bit, but he has just been super dominate this season for the Commanders. He is leading the AAF in interceptions and I feel several teams will call him after his play. His pick six last week was amazing, it was on a two point conversion try. The kid is balling and I have always been a huge fan. Nick Truesdell, TE, Salt Lake City – Nick Truesdell is making a name for himself. The 29-year-old has become Mr. Reliant. He had a streak going where he was targeted 20 times on the year and he caught all 20 receptions. With how bad teams have a need at the tight end position, I would guarantee, that Truesdell gets at least a workout. 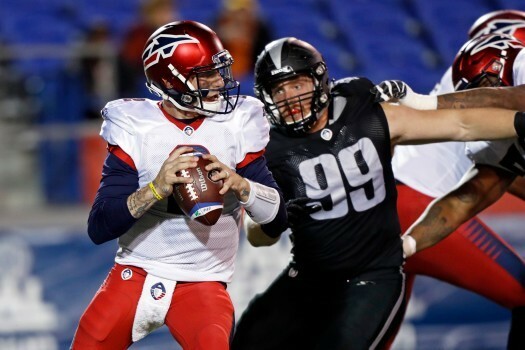 Jake Payne, DE, Birmingham Iron – Last week, the former Arena Football League standout was wreaking havoc on the quarterback every snap. He is a stud pass rusher, and he is showing his worth. I love this kid, he has great size and speed off the edge. He will get a shot if he keeps it up. Reece Horn, WR, Memphis Express – Reece Horn is the best thing on the Memphis Express. He has been a huge asset to their return game, as well as Mr. Reliable for the quarterbacks. Horn is one of the only consistent things that have been moving in the right direction for the Express. The former Italy stand-out is earning his keep. Garrett Gilbert, QB, Orlando Apollos – Let’s face it the Apollos are the best team in the AAF because they have the best quarterback. Right now, Gilbert maybe the best quarterback in Florida. He is throwing the ball well and I feel he will get a shot with an NFL team in a camp. He could be a very reliable back-up. There are so many guys who deserve this award, but I will continue to keep pushing guys I feel deserve a shot. There are so many others who will get a shot, but I wanted to recognize these five players above.